In Africa the fun doesn’t stop when the sun sets. On Safari, the sky is the limit! spot – perhaps on a hill with an expansive view, or maybe next to a waterhole for an optimal spot to view game coming in to drink. The guide sets up a bush bar with traditional G&Ts, sodas, and some local snacks such as biltong, dried fruits, nuts etc., and you will toast the beauty of the setting sun. Sleep-out platforms are popular; these are wooden structures with proper beds on the top level, which are open to the night sky. These tree-top elevated “rooms” keep guests safe from nocturnal animals while they stare into the vast starry universe above. The latest luxury offerings are decked out tree-houses that redefine the term in a most discerning way. 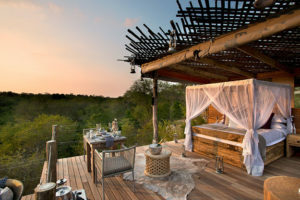 Focus is on exclusive privacy and utmost comfort in a most enviable location – usually around a waterhole. Fly camping takes travelers out to remote areas where they sleep on comfy bedrolls tucked under netting that keeps bugs out but won’t hinder views of the night sky. 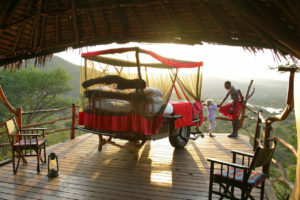 Some lodges have roll-out beds in the rooms – beds with wheels – so guests can roll their bed out onto their veranda at night and fall asleep in comfort while stars twinkle above. While sleeping under the stars is nice, there is also plenty of reasons to stay awake after dark! Many safari areas in Africa are also incredible areas for stargazing. Namibia is a particular standout. It has some of the darkest skies on the planet due to little or night light pollution. Several luxury properties have sophisticated telescopes or even have astrologists on staff to offer stargazing activities. The NamibRand Nature Reserve, just south of Sossusvlei, was recently designated as Africa’s first official “International Dark Sky Reserve” by the International Dark Sky Association due to low light pollution and unbelievably clear night skies. 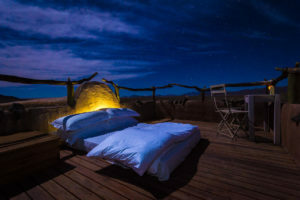 All of our Namibia packages offer breathtaking views of the vast and incredibly clear night skies. Also ask about night game drives! Some areas in Africa offer safari-goers the opportunity to experience a game drive after dark with the moon, stars, and a few spotlights to light the way. Guests have the chance to catch a fleeting glimpse of some of Africa’s nocturnal animals including the hyenas, honey badger, pangolin, aardwolf, and civet! Look up into the trees and you might spy a leopard with its prey or hear a rustle and find yourself staring into the wide eyes of an African bushbaby. There is something primal about driving around in the African wilderness after dark. Nighttime on safari is loaded with options to push your personal envelope and all are humbling, sensory-loaded, and unforgettable!